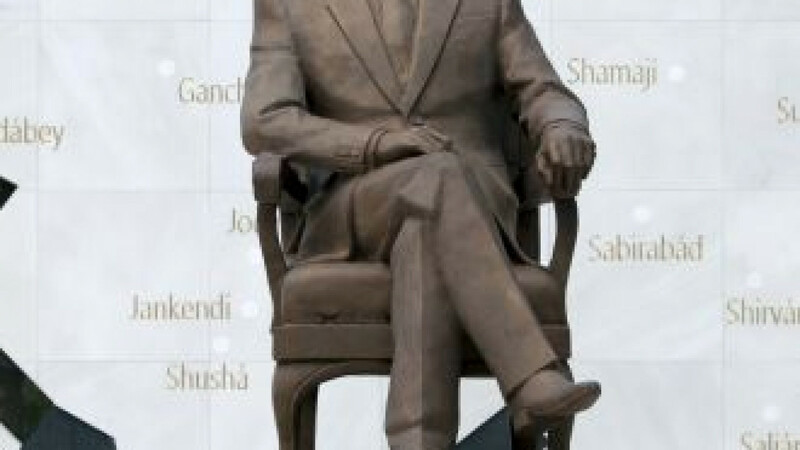 The appearance of a life-size statue of Azerbaijan’s “founder of the nation” on Mexico City’s elegant Reforma Avenue, not far from Mahatma Gandhi, Abraham Lincoln and Mexico’s national heroes, is raising eyebrows and protests. The Stalinesque bronze statue of Geidar Aliyev, the late authoritarian leader of the Caucasus republic, carries a plaque calling him “a brilliant example of infinite devotion to the motherland, loyal to the universal ideals of world peace.” The monument, erected in late August, shows Aliyev sitting in a bronze chair in front of what appears to be an enormous, white marble map of Azerbaijan. It turns out that Azerbaijan contributed much of the 65 million pesos ($5 million) it cost to renovate not one, but two Mexico City parks, allowing it to put monuments in both. Critics say that Aliyev, who stifled dissent, shouldn’t be on a boulevard decorated with statues to Mexican and foreign heroes. It wouldn’t be the first time that Azerbaijani PR efforts have drawn criticism. Rights groups protested Azerbaijan’s hosting of the Eurovision Song Contest, and the militant feminist group Femen protested its hosting of this year’s European Cup soccer championship. Azerbaijan’s ambassador to Mexico, Ilgar Mukhtarov, wrote that Azerbaijan has lavished attention on Mexico because it was one of the first countries to recognize Azerbaijan after the breakup of the Soviet Union. “This monument is not intended to improve anybody’s reputation because the world’s perception of Heydar Aliyev does not require any rescuing,” he said. Aliyev’s monument is surrounded by a manicured lawn and flower beds, and many people like the new park. “The people who come here, they like it, right, but they don’t know who he is,” said Torres. And that’s the secret to Aliyev’s success. Nobody really knows who he is. A second Azerbaijani statue appears in the other park they paid to renovate, Tlaxcoaque Park. But at the inauguration of the first monument, Ebrard said: “We are very thankful to the Republic of Azerbaijan, because the truth is we haven’t received an investment this big” from a foreign government before.